This is a gibbous Moon. More Earthlings are familiar with a full moon, when the entire face of Luna is lit by the Sun, and a crescent moon, when only a sliver of the Moon’s face is lit. When more than half of the Moon is illuminated, though, but still short of full illumination, the phase is called gibbous. Rarely seen in television and movies, gibbous moons are quite common in the actual night sky. The featured image was taken in Jämtland, Sweden near the end of last month. That gibbous moon turned, in a few days, into a crescent moon, and then a new moon, then back to a crescent, and a few days ago back to gibbous. And this same gibbous moon is visible again tonight, leading up to the Full Beaver Moon that occurs Friday night. 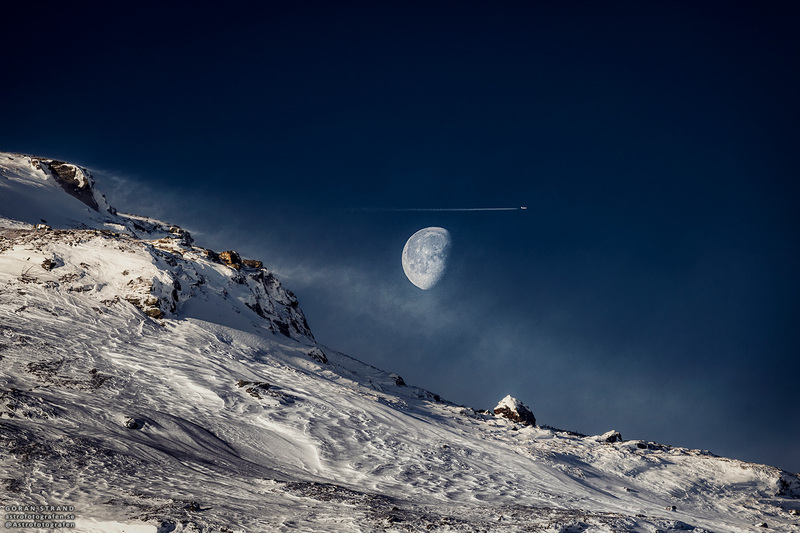 Setting up to capture a picturesque gibbous moonscape, the photographer was quite surprised to find an airplane, surely well in the foreground, appearing to fly past it.